How ten centuries of Chinese women submitted to the painful practice—and how it finally went out of fashion. For around ten centuries, successive generations of Chinese women endured a practice when, as children, their feet were systematically broken and shaped in such a way that they resembled hooves. 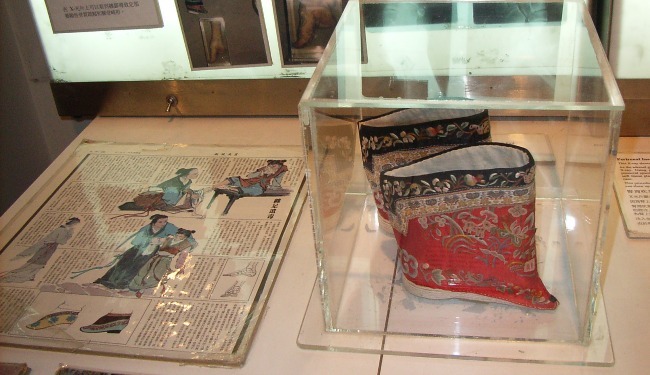 The tradition, known as foot binding, eventually came to symbolize China's backwardness, a relic from the country's distant past. Yesterday she came in a delicate blue satin of a more fashionable cut than I had ever seen; her feet were unbound and in little clumping, square, black-leather foreign shoes. She was evidently very proud of them; they looked like shoes for a very rough little American boy, and had steel taps on the heels. They stuck out most oddly from her exquisite brocaded skirt. After we had exchanged polite remarks, and had taken our first sip of tea, she was so evidently conscious of her feet that I could not but comment on her unusual footgear. When—and why—did the practice of foot binding begin? The first recorded binding occurred in the Five Dynasties and Ten States period in the 10th century. According to the story, an emperor had a favorite concubine, a dancer who built a gilded stage in the shape of a lotus flower. When she bound her feet into a hoof-like shape and danced on the lotus, the practice became very fashionable; after all, she was the emperor's favorite concubine and the other concubines attempted to imitate her in order to gain the emperor's favor. So foot binding started with the royal court and then spread throughout China, beginning in the south of the country and soon reaching the north. In the 12th century, foot binding had become much more widespread, and by the early Qing Dynasty (in the mid-17th century), every girl who wished to marry had her feet bound. The only people who didn't bind their feet were the very poor, ethnic Hakka people, and women who worked in fishing because they had needed to have normal feet in order to balance themselves on boats. At what age did girls get their feet bound? What did the practice entail? Girls would have their feet bound between the ages of four and six; any younger, the girls couldn't endure the pain, and by the time they were older than six their feet had already grown too large. Four to six was the ideal age because you could reason with the girls and help them deal with the pain. Foot binding would occur in a ritualistic ceremony accompanied by other traditions intending to ward of bad luck. The procedure entailed bending the girls' toes underneath the sole, using very long ribbons to wrap their feet all the way to the ankle. Basically, the idea was to keep breaking the foot whenever it grew too large, a process that usually took between two and three years. Then the feet would be bound for the rest of the girl's life. The girls, naturally, developed a peculiar way of walking—almost as if they had hooves. And in order to facilitate moving around, women with bound feet developed strong muscles in their hips, thighs, and buttocks, so much so that these characteristics were considered physically attractive to the Chinese men of the era. When did foot binding go out of favor? In the 19th century, toward the end of the Qing Dynasty, Western countries effectively colonized China and many Western people began to move to the country. This coincided with the height of foot binding, when the practice was most prevalent. So many Western women, especially the wives of Christian missionaries, became strong advocates against the practice, producing pamphlets and even opening shelters in support of afflicted women. Around the same time, Chinese intellectuals who had studied abroad in Europe and in North America returned to China and stated their support for abolishment. So by the time Pearl Buck was writing in 1923, after the Qing Dynasty had fallen, the practice had become unfashionable. This change in fashion suddenly had a perverse side effect: a lot of girls who had had their feet bound in order to become marriageable suddenly found themselves abandoned by their husbands because foot binding was no longer fashionable. Worse, in bigger cities some people would catch women with bound feet and cut off their bindings, a humiliation because these women would never, ever show their bare feet to anyone—not even their husbands. For them, the process that began with a lot of pain and tears likewise ended with pain and tears. By the time Mao Zedong took control of China in 1949, foot binding was gone except in a few remote, mountainous areas in the country. Was there any push-back in support of foot binding among traditionalists? Definitely. In Shanghai there were several debates between advocates of foot binding and advocates of natural feet—debates that were well-attended by both men and women. At first, those who supported foot binding won these debates, but eventually those that opposed it prevailed. One reason was this: Unbound women would show off their beautiful bare feet, which stood in such stark contrast to the disturbing, ugly images of bound feet, which only looked good in artisan-crafted embroidered shoes. Are there any surviving people with bound feet today? I've heard from a few people who saw some old ladies in Guangxi Province in southwest China who had bound feet, but people like that are very rare these days. Recently, though, a Western man actually approached me and asked me if I would be willing to bind his feet for him.